Stasey Simon, an outspoken sports talk radio host, suggests on-air that someone should knock some sense into the Toronto baseball team’s temperamental pitcher. 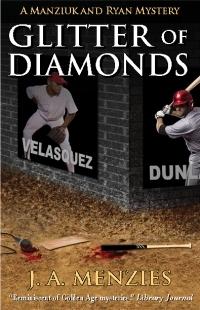 Shortly after, members of the media, teammates, and fans become suspects in an ugly murder. Police detective Paul Manziuk draws on his knowledge of baseball while his new partner, Jacquie Ryan, tries to understand a game she’s never watched.